When I lived in Waterloo, I used to be able to say that when I left my house, if I went right I'd be driving past farm fields in two minutes and if I went left I could be in downtown Waterloo in about three minutes. Having only lived in the Toronto and Boston areas before moving to Waterloo, being close to farms was a new experience—and one I really enjoyed (by the time I moved away, I was also a two-minute drive from Walmart—the neighbourhood was changing). The western edge of Waterloo may have seemed somewhat rural to a Torontonian's eyes, but now that I've been living and working in the small urban and rural parts of Southwestern Ontario for a while, I finally know what real farm country looks like. 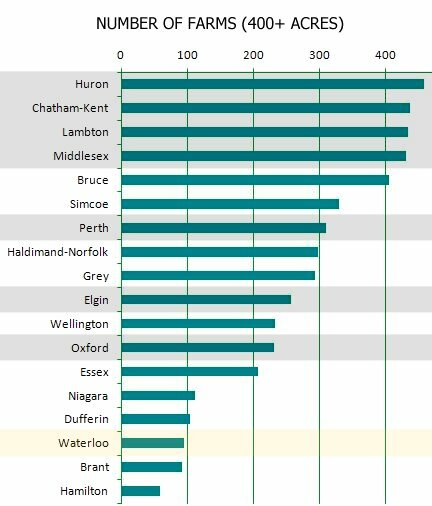 Waterloo falls near the bottom of the list for number of farms, although its neighbour to the northeast takes the top spot and Perth County to the west is just three spots below. You were surrounded by farms in Waterloo, but there weren't so many in the region itself. I now live in Middlesex County, which places third on the list and the grey shaded areas are the counties that border on my home county (I shaded Middlesex as well). This is farm country. Huron County is the clear leader, with Chatham-Kent, Lambton and Middlesex following in tight pack. 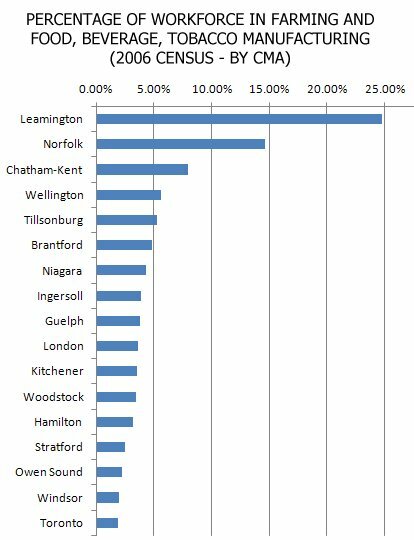 With so many farms surrounding them, you can see why the City of London (included in the Middlesex numbers here) and the Region of Waterloo have both emphasized food processing as a key component of their economic development plans. Both LEDC in London and CTT in Waterloo Region promote their areas as food processing centres. Both are members of the Ontario Food Cluster, along with the folks in Middlesex County, SLEP, SWEA, SOMA, Chatham-Kent and other parts of Southwestern Ontario (Toronto as well). London is particularly well-positioned to become a food processing centre (or a larger one than it already is). When you look at a map of Southwestern Ontario, there's Waterloo Region and Guelph on the eastern edge and Windsor to the west, and then a large ring of farmland surrounding the London area and no other big urban centres nearby. When I was the roving representative of the Ontario Network of Excellence program across this area, one of the leading challenges was to figure out how government-funded "innovation" programs could be made more relevant within this sector. Bioenterprise in Guelph has done a good job working with innovators in the agri-tech space, and it's very different from the digital media or medical devices spaces that I've had more experience with and where innovation resources tend to be focused. 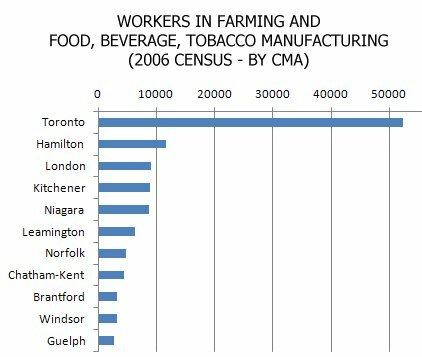 The 2011 numbers haven't been released yet, but at the time of the 2006 general census, the percentage of the workforce in the London and Kitchener CMAs (in London's case, that includes parts of Middlesex and Elgin, as well as St. Thomas) was only around 4%, but they were two of the biggest areas for food processing/farming in the province. There have been some big plant closings and expansions over the years since 2006, so it will be interesting to see where things are when the 2011 numbers are released. 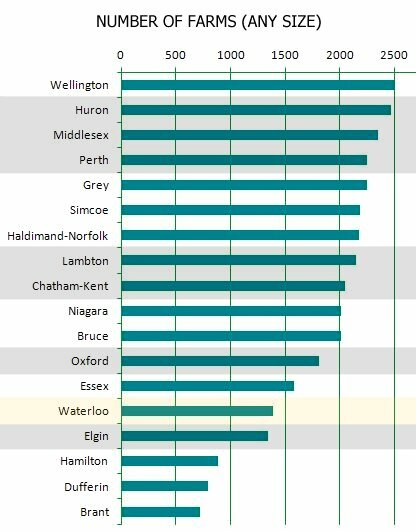 But the general pattern should be similar: the Toronto CMA, which includes most of the GTA, will dwarf everyone else, and Hamilton, London, Kitchener, and Niagara should all continue to show strong numbers. Plantform also has an office at The Research Park in Sarnia.